Weird. I was just thinking the other day about how review scores are affected by how "reviewer-friendly" a game is. I remember Gabe at Penny Arcade talking about Assassin's Creed and how it must have sucked for reviewers to have this crazy open world to have to blow through in order to finish their reviews on time. I wonder how many reviews of Dragon Age will be based on a complete playthrough? That game is supposed to be, what, 80 hours long? On one playthrough? With a dozen different combinations of gender, race, class, and origin? As a regular player, that's a daunting prospect. I can only imagine how reviewers feel. It's a real concern. I know I almost always feel squeezed by deadlines. In fact, I just found out I have an extra week with Borderlands, which is a godsend. But even then -- this is a game with four character classes, each of which can be developed in three different ways, and I'll be lucky if I max out just one of them. All I can think about with each choice I make is how many paths I've just closed off, and wonder to what extent that's altering my experience with the game. It's easier with something like Uncharted to say, hey, we all had the same experience here. That's probably why the reviews have been unanimous. Uncharted 2 is a great game. On par with the Halo games on the Xbox (and yes this does mean I bought a PS3 now that the price has dropped!). 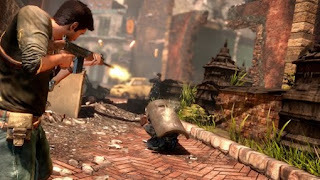 Uncharted 2 is not perfect, and none of them are, and to me the gun play is the best part, followed by the story, with platforming a solid #3. Is it replayable? I don't tend to ever replay action games so probably not. Do I care about multiplayer? No, not really. So it's 8+ hours of really fun thrills and chills, and it is very satisfying with a likeable cast of characters and top notch production values.